DSG International manufactures disposable baby diapers, adult incontinence, feminine hygiene and training pants products.DSG had an opportunity to acquire Drypers to consolidate operations of the 4th and 5th largest private label diaper manufacturers, and create the 2nd largest corporate brand manufacturer in the United States. Its products are distributed in the United States and Canada. Its sales exceeded $160 million post acquisitions.Professionals of M&A Capital were hired by DSG to, among other things, negotiate the terms of an acquisition of Drypers with the seller and its advisor, including the purchase price, break-up fee and other protections. DSG International manufactures disposable baby diapers, adult incontinence, feminine hygiene and training pants products. 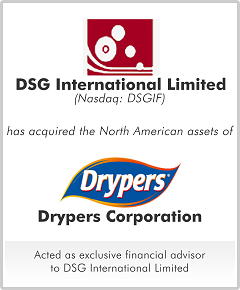 DSG had an opportunity to acquire Drypers to consolidate operations of the 4th and 5th largest private label diaper manufacturers, and create the 2nd largest corporate brand manufacturer in the United States. Its products are distributed in the United States and Canada. Its sales exceeded $160 million post acquisitions. Professionals of M&A Capital were hired by DSG International to, among other things, source the capital necessary to fund the acquisition of Drypers. 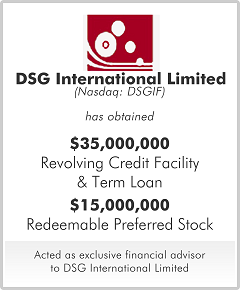 As placement agent and financial advisor to DSG International, M&A Capital professionals raised a $35 million revolving credit facility and $15 million of redeemable preferred stock to accommodate the acquisition and consolidation of Drypers and DSG.